Garage doors, being the first thing that you can see on the front facade, largely contribute to the overall appearance of your residence. Your curb appeal can be enhanced by simply changing the appearance of your garage door. However, this doesn’t mean that you have to overspend on renovating your garage just to make your curb a bit more attractive. If you feel that your home exterior needs a little makeover, then you’re in the right place as we’ll provide you with tips on how you can refurbish your garage door to complement your curb appeal. Solid pane garage doors are quite outdated and they seem a little boring. 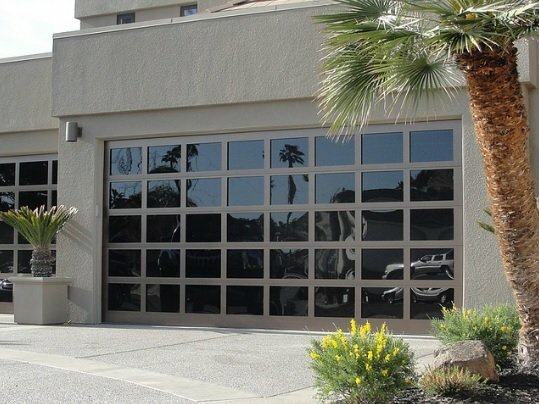 Changing them into glass type, multi pane door type will give your garage a fresh and modern look. 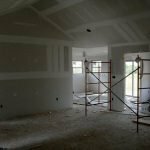 Aside from enhancing the appearance of your garage from the outer perspective, it will also make your home look a lot less crowded from the inside. You’ll have a better view of your lawn and at the same time, people from the outside can get a peek of your beautiful interiors. A quick way to make your curb look more appealing is to change the color of your front façade, including your garage door. Choose colors that will complement your lawn and your curb design. If you have a nice, green lawn, give your façade a nice, yellow tone instead of using earthy hues. This will make your home stand out and enhance your curb appeal. TIP: Try our free Home Remodeling Costs Estimator and find out in minutes how much a new garage door will cost. Plain looking garage doors are very common and even though it symbolizes simplicity, they still won’t improve your curb appeal. Instead, add a few details to your bare garage door. You can paint or weld a couple of lines, shapes and art to make it look more modern and appealing. The designs don’t really need to be balanced and regular. Sometimes, asymmetry gets the job done. If your curb appeal is close to being perfect, yet you still feel that there’s something’s missing, try to add a couple of outdoor wall mounted lights to your garage door. Just remember that there are still some factors to consider when choosing the correct light fixture. Choose an outdoor wall light that will complement the overall appearance of your home. If you get this one right, you will have a more enticing curb appeal and everyone will surely notice your front garage. Wooden garage doors are prone to absorbing high levels of moisture and it may eventually rot if not treated properly. A rotting garage door will definitely hurt your curb appeal. While repair is the first-hand solution, also consider switching from wood to steel-made garage doors which can last longer than the usual wooden doors. Aside from improving your overall curb appeal, it also helps you to save money in the long run. Wooden garage doors are known to be high maintenance, but they provide classy and sophisticated look from the outside. If you wish to keep your old, wooden garage door, then it’s time to give it a new look so that it will complement your curb appeal. One way to refurbish your old wooden garage door is to use gel stains. This will give a strong wood color to your garage without having to spend much. You can buy gel stains for less than 20 bucks and you can do it yourself to save on labor cost. Have you ever considered widening garage door? Well, this option might be costly as you have to reinstall everything, including the walls and the doors. However, when you’re aspiring for a better curb appeal, you may want to broaden your doors to make your house look a bit bigger from the outside. However, Before expanding your garage, think about how much space you can spare for this renovation project. Rectangular garage doors are somewhat overrated. Most people choose this type because it is easier to build and it practically goes along with any type of home exterior. However, if you want to enhance your curb appeal, this is something that you may want to change. There are many types of garage doors other than the rectangular ones. You can opt to have a curve-shaped garage door or a cornered opening instead. This will provide your house with a softer tone, especially when you already have lots of edges on your exterior. Aside from these, there are still a lot of things that you can do with your garage door. However, if you choose to refurbish it, always remember that you don’t have to overspend just to make an exemplary curb appeal. 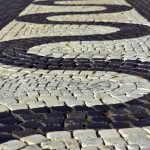 In the end, it will still depend on your landscaping, personal preference, and budget. The garage doors in these pictures are gorgeous, and I didn’t realize there were so many ways to customize a garage door. Thanks for sharing! A detailed garage door really does add some character to your home. The black door you showed here is gorgeous. I can’t believe these doors actually exist. These are some really beautiful garage doors. I like the ones that are made of wood. I particularly like the last photo because the doors are arched. That looks like something that would add a lot of value to your property. My wife and I have been thinking about replacing the garage door at our house, but weren’t sure what to choose. It’s interesting that steel can actually last a lot longer. Since we want to get the most out of it that we can, this would be really nice. These are some really impressive doors. I like the rounded arched ones. It does seem like it would add a lot of value to your home. I would want to buy a home that had amazing garage doors like that. These doors are fabulous. I personally loved the glass garage door and also the wooden garage door. But in all, each and every one of it is really good. Thank you for sharing the images and article. Keep posting in future too. I like how you explained that wooden garage doors may have a more appealing aesthetic but may require more maintenance. My husband is wanting to put a wooden garage door on his uncle’s cabin. However, he might want to reconsider and go for a more durable material. I love the wooden garage doors with the arched windows. Using gel stains to give it a new color is a great idea. My husband and I are planning on having our old garage door replaced with a nicer one this year. I think I might choose one that looks similar the wooden one in the picture. I’ll have to remember your tip about staining it. Great article! It’s helpful to know that a wooden garage door is prone to absorbing high levels of moisture and may eventually rot if not treated properly. I was planning on having a wooden one installed soon, I’ll probably just shift to steel. I really liked your comment about adding a few lines or details to the door. People are naturally drawn to lines and this could help people notice the house. Thank you so much for the helpful door tips! Useful information, thanks for your post . . .
Wow! This is amazing. Love your blog on Garage door tips. Thanks for that. We’ve been thinking about getting a new residential garage door installation. I’m glad you talked about how you can reconsider its shape. I’m going to have to do some shopping around with my wife and see if we can find a good residential garage door installation! Thanks for pointing out that you can widen your garage door to get some better curb appeal because it’ll make your home look bigger. My current one is starting to look really warped and ugly, and I think that I’ll need a new one. It seems like getting a new, wider garage door would be a good idea. I have recently been thinking about changing my garage door because it is getting old and has some damage. I really appreciated the part about adding details to a blank door. I think that painting or welding a few lines and shapes and art to make it look more modern and appealing. It’s great that you elaborated on maintaining your garage door to improve your curb appeal, it was very insightful. I agree that lighting your driveway is a great way to improve the look of your garage door, it makes the home look more bright. My mom is getting ready to sell her home and she wants to make sure it looks great, I will be sure to share this with her.